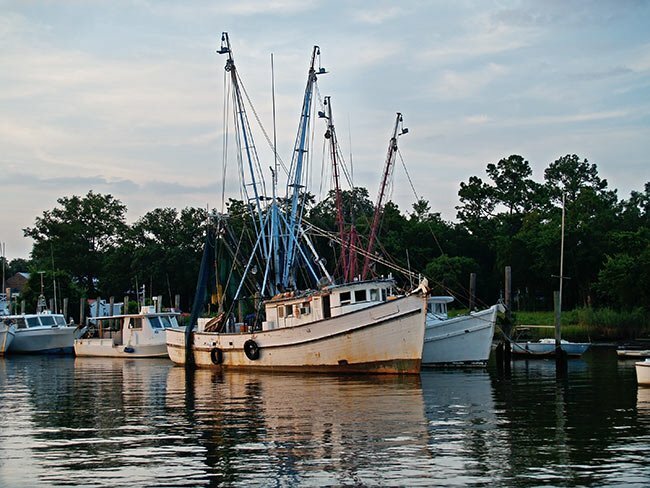 Georgetown is a small, picturesque seaport and South Carolina's third oldest city. It is located 35 miles south of Myrtle Beach and 65 miles north of Charleston, on Winyah Bay, where the Sampit River, Black River, Great Pee Dee River, and Waccamaw River merge. Here is a map of the Georgetown area. In addition to this historic harbor town, Georgetown County is home to several other great towns and beaches. Murrells Inlet and Pawleys Island are two well-known coastal communities, and Andrews is a small town within its borders. Georgetown's downtown area borders the Haborwalk, which overlooks the scenic Sampit River. Front Street is also a favorite spot among tourists and locals. Here you'll find historic buildings that house everything from museums to art galleries to restaurants. If you're heading to Georgetown in October, try to plan your trip around the annual Wooden Boat Show. The festival is held along the waterfront and is a great way to experience the history and culture of the city. Collect sea shells, see Dolphins in their natural habitat, and view the Georgetown Lighthouse. Moments after boarding the pontoon boat, you'll be gliding across the water on a naturalist-guided tour that will educate as well as fascinate. Georgetown is home to four museums devoted to everything from maritime history to rice culture. There are also several plantations you can tour. The Georgetown Lighthouse - also called the North Island Light - is the older of the two federally-operated lighthouses that remain in South Carolina. Guarding the entrance to Winyah Bay in Georgetown County, the lighthouse was built in 1811 and restored in 1867 after suffering damage during the Civil War. More than 16,000 acres comprise this pristine research reserve in Georgetown. The native Waccamaws who originally inhabited the land called it "Hobcaw," meaning "between the waters." The name references its location between the Winyah Bay, which is fed by several surrounding rivers, and the Atlantic Ocean. Brookgreen Gardens is one of South Carolina's most beloved landmarks. Located just south of Murrells Inlet in Georgetown County, this historic sculpture garden and wildlife preserve is a favorite destination for both locals and visitors. Stunning ocean vistas beckons visitors to Huntington Beach State Park in Murrells Inlet. The park features three miles of undeveloped beachfront – an uncommon treat along South Carolina's heavily-developed shores. Nature trails and boardwalks wind through the park, leading guests through the maritime forest and into the salt marsh. There are no hotels directly in Georgetown's downtown historic district, just a few bed and breakfast inns. Most Georgetown hotels are located on US 17 as you enter the city driving south and are just a short drive from the downtown area. These are the last hotels along US 17 until you reach Mount Pleasant. Our maps of Georgetown and Georgetown County include boundaries, highways, streets, parking, and historic districts. Georgetown is home to one local airport and two nearby commercial airports. MYR is closer. Our exclusive Georgetown job board organizes jobs by type of employer, company name, and area within Georgetown. Waccamaw Regional has a full-service SC Works Center in Georgetown. This facility is a hub where clients can find a variety of employment and training resources – most offered for free – under one roof. Georgetown lies within the Myrtle Beach service area, and most of its television and radio stations are located in Myrtle Beach.